In 1970 Samarkand celebrated its 2500th anniversary. According to legend, it was on the banks of the river Siab, that the Turanian king and hero Afrosiab, a character of the folk epic Shahnamae, established the capital of the Sogdian people. Known as Afrosiab, then Marakanda and finally Samarkand, the settlement occupied more than 200 hectares. Although the Sogdians fought invaders fiercely, it became part of the Persian Achaemenid Empire in the 6th century BC. Alexander the Great had said "Everything I have heard about Samarkand is the truth except that it is much more beautiful than I could imagine". Yet in 329 BC he conquered and destroyed the city and its complex network of irrigation channels, as punishment for the Sogdian revolts that had considerably slowed his campaign. (It was in Samarkand that Alexander killed his childhood friend Cleitus). In the 1st century AD it was part of the Great Kushan empire and, because of the city's strategic location in the Zerafshan River valley, it blossomed again. The Sogdians became the principal merchants of the Great Silk Road. In fact they so dominated the fabled trade route that their language became the Silk Road's lingua franca. In 1907 near Dunhuang in China, Hungarian-British archaeologist Aurel Stein discovered ancient Sogdian letters written in 314 AD. They provide evidence of an extensive network of Sogdian merchants in China, whose commercial interests included precious metals, spices and cloth. The Sogdians were followers of Zoroastrianism: the first written mention of Samarkand is traced to the holy Zoroastrian book Avesta. However, it was clearly a tolerant society as Buddhist temples as well as Christian churches existed; in fact a Christian Nestorian bishopric in Samarkand was established in the 6th century AD. Samarkand was conquered by the Arabs in the 8th century and became the first capital of the Samanids and a cultural centre of Islam. The first excavations on the Afrosiab hill site were undertaken by Russian archaeologists in the 1880s. Many objects discovered then and on later Soviet digs were removed to St Petersburg, and remain there. 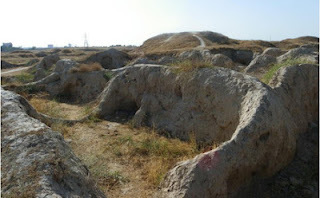 Since independence, excavations are ongoing and an Uzbek-French collaboration revealed that as far back as the 9th – 8th centuries BC there existed a large settlement with a strong citadel, a palace, residential buildings, utility structures, and temples. It was surrounded by an 8-meter-thick fortification wall made of adobe blocks. From the citadel on the hillock around the Afrosiab museum, is a panoramic view of the ancient city. Outlines of streets and artisan quarters are visible as well as extant parts of the clay kilns and production dumps of glass-blowers, blacksmiths and potters. 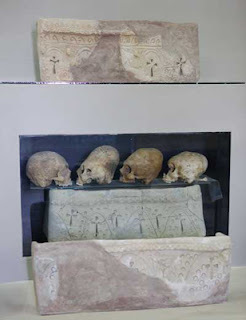 It was a sophisticated society: the Afrosiab museum display includes bronze and ceramic articles, ossuaries, gems, coins, jewellery and bowls dating to that period. The citadel's excavation revealed the greatest treasures: 7th century AD frescoes of vivid colours and figures that immediately brought to life the ruler's court. The central one shows a reception of emissaries from various countries, riding camels. A member of the entourage wears a garment with an inscription in the Sogdian language: the Chaganian ruler’s friendly greeting for the ruler of Sogd. 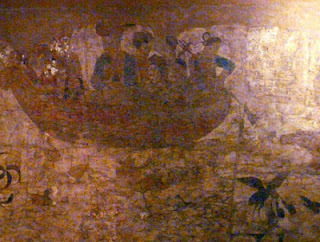 Another frescoe depicts the arrival of a royal bride and her entourage, and the third a Chinese princess being rowed across a river. 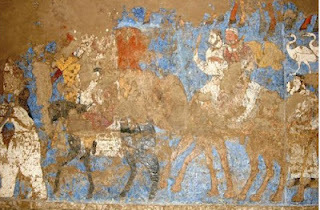 On an Uzbek Journeys tour you will visit the museum's artifacts and frescoes first. This helps put into perspective the surrounding excavations on the hillsides, which will be visited later. In 1220 Genghis Khan’s warriors took Samarkand by storm, plundered it and burnt it down.The citizens did not rebuild on the same site. Instead they rebuilt in the suburbs, which became the site of Amir Timur's glorious capital in the 14th - 15th centuries.